The end of the world is a seemingly interminable topic Ð at least, of course, until it happens. Environmental catastrophe and planetary apocalypse are subjects of enduring fascination and, as ethnographic studies show, human cultures have approached them in very different ways. Indeed, in the face of the growing perception of the dire effects of global warming, some of these visions have been given a new lease on life. Information and analyses concerning the human causes and the catastrophic consequences of the planetary ‘crisis’ have been accumulating at an ever-increasing rate, mobilising popular opinion as well as academic reflection. 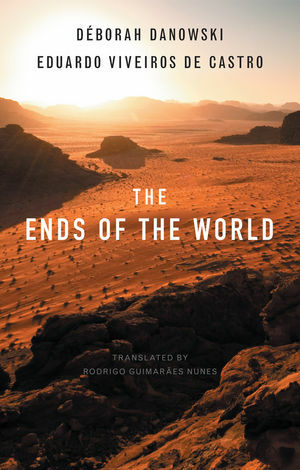 In this book, philosopher Déborah Danowski and anthropologist Eduardo Viveiros de Castro offer a bold overview and interpretation of these current discourses on ‘the end of the world’, reading them as thought experiments on the decline of the West’s anthropological adventure Ð that is, as attempts, though not necessarily intentional ones, at inventing a mythology that is adequate to the present. This work has important implications for the future development of ecological practices and it will appeal to a broad audience interested in contemporary anthropology, philosophy, and environmentalism. Déborah Danowski is Professor of Philosophy at the Pontifical Catholic University of Rio de Janeiro. Eduardo Viveiros de Castro is Professor of Anthropology at the National Museum of the Federal University of Rio de Janeiro. Chapter 3 É Slouches towards Bethlehem to be born?